New poster for Paul Gerrard's EXHIBITS exclusive to WithoutYourHead! Paul Gerrard, creator of Hellraiser: Origins, along with Mike Clarke and Paul Griffiths, is moving toward production for their horrific feature film EXHIBITS. Set to be shot in the UK, EXHIBITS is using a similar structure to an anthology film but with a singular director vision. 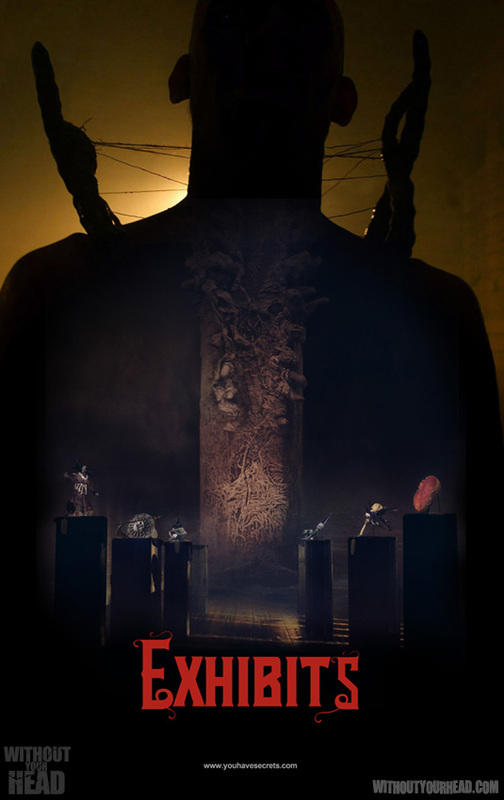 Synopsis: "Centered around a museum of the macabre. Each exhibit in the museum is a link to a story of untold horrors and dark secrets. The visitors all have secrets to be told. The museum is neither Heaven nor Hell. It isn’t even Purgatory. It is a timeless place of judgement set before thy self. The mirror, for which they see themselves through, is The Curator. You will either survive or die, he will decide. Each Story is a portal, a glimpse into worlds unseen. Provocatively visual, visceral, imaginative… EXHIBITS is dark Fantasy at its best."